The project sees Hagar share his passion for food and his secrets for rock-and-roll entertaining, including his favorite recipes from home, on the road, and his go-to vacation spots, Cabo and Maui. The singer is joined by his celebrity chef friends from around the globe for insights into entertaining as readers pour over more than 50 food and drink recipes. Hagar also shares his greatest drink recipes - accompanied by true stories of the wild nights that brought them to life. A six-date book signing tour starts September 14 in Ridgewood, NJ with stops in New York, Illinois, Missouri and California. “Are We Having Any Fun Yet? 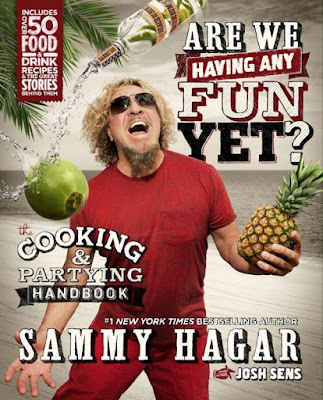 The Cooking & Partying Handbook” is Hagar’s second run as an author: in 2011, he published his memoir “Red: My Uncensored Life In Rock”, which topped the New York Times Best Sellers List. Hagar’s latest supergroup, The Circle, are on a short break from playing a series of live dates across the States; they’ll return for more shows in early September. The guitarist will host his annual birthday bash concert series in Cabo San Lucas, Mexico in October in celebration of his 68th birthday.